Our first offshore sail – a total of 35 nautical miles! 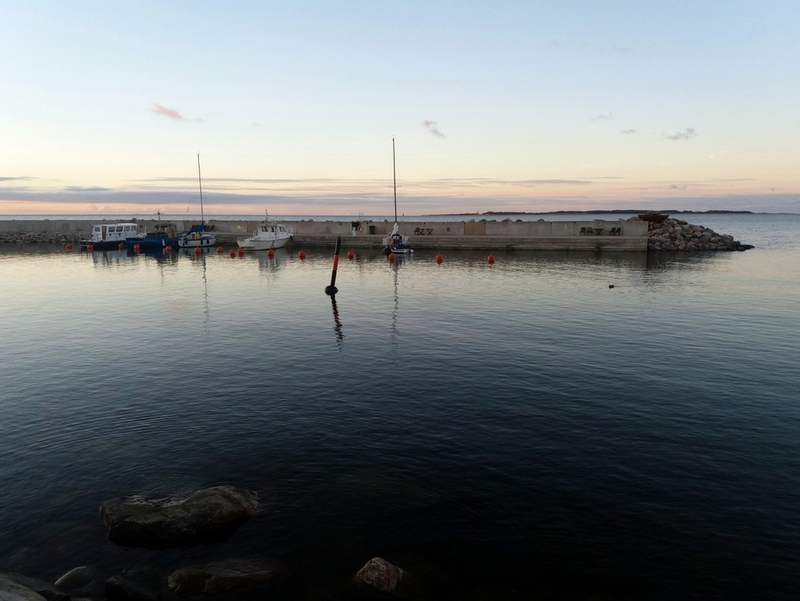 – came to an end early in the afternoon, as we were approaching the Estonian coast in Lahemaa National Park some 80 km east of the capital city, Tallinn. Not quite like the ocean crossings we’ve all seen on youtube, but we had thoroughly enjoyed our day in the open sea, in the fresh breeze and sunlight. We felt happy and windblown, and it felt good to touch land. The marina was called Viinistu and it seemed like a very nice place – there was a small breakwater, mooring balls, and a very good restaurant. And on top of it all a big Art Museum built inside a former fish processing plant, something we had definitely not expected to find in such a remote place! The atmosphere was very international, with cyclists, motorcyclists, campers and other travellers from all around Europe. And it was already past the peak holiday season, so I can only imagine how busy this place must have been in July! The evening was beautiful with calm waters and even a nearly full moon. We curled up in our bunks, eager to get some sleep and then continue our journey the next morning. But the next morning – we woke up to this! I had slept like an Egyptian mummy, as I always do, but other members of the crew had witnessed some slight rocking and increasing sound of wind during the night. However, by the time I got up the wind was howling and there were big waves splashing over the breakwater and flowing in through the opening and into the harbour. There was no way we could motor out of the marina. Our 8 horsepower Yanmar, as reliable as it is, just doesn’t have that extra kick to push the boat against such a current. The worst case scenario – being stuck sideways in the breakwater opening – made us decide to stay and wait for the wind to pass or shift. Continue to the next post – Start our trip from the beginning!